Fanned-Fret Innovations, a proprietary design by Ralph Novak. Available in Chrome or Black, these solid brass bridges use the classic "three point suspension" design, with through-body stringing. 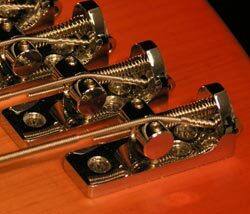 They are supplied with matching metal saddles and can accept GraphTech "StringSaver" and "Acousti-Phonic" saddles. Sets include mounting screws. They will accommodate a 7/16" (11mm) string spacing.